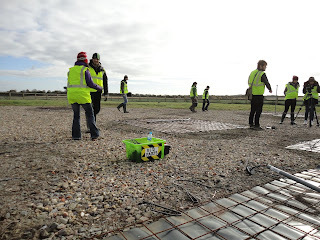 I just got back from the LOFAR-UK repair day today, and I'm happy to report it was a big success, and also great fun. We finished almost all the repairs from the storm damage last month, and now all but one LBA and one HBA should be running as normal (those last two will be fixed very soon). 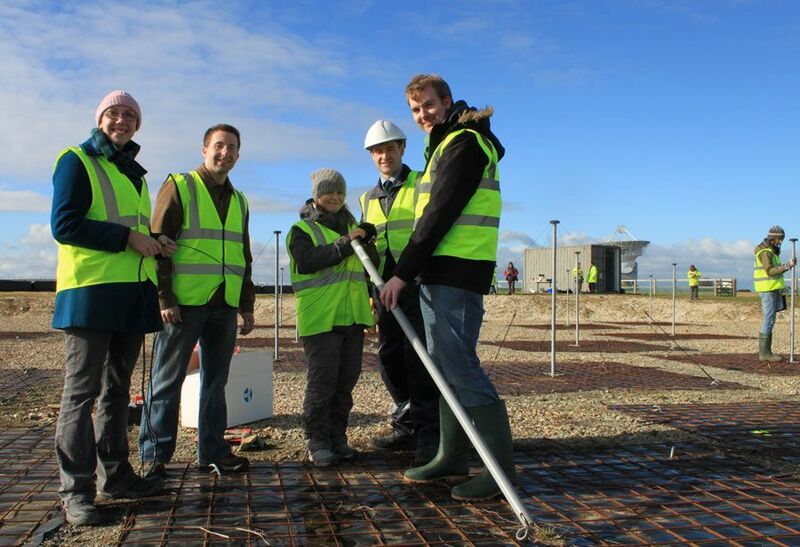 Almost 20 volunteer workers (postgrad students and researchers) from the nearby LOFAR-UK Universities in Portsmouth, Southampton and Oxford joined STFC employees for the day of repairs. We started with the LBA repairs. 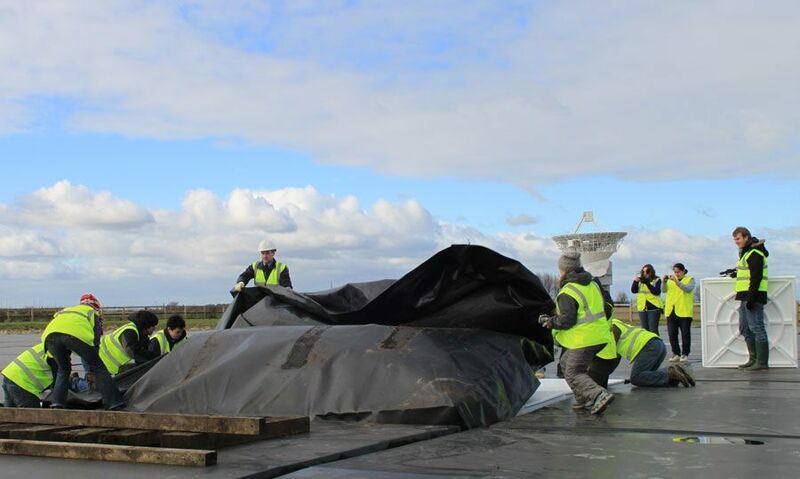 You might remember that 15 of these in total were damaged and destroyed in the stormy weather - mostly by debris from a broken HBA blowing over the field (and we must not forget again to thank the Chilbolton based STFC staff for their amazing work during the storm to prevent even more damage). 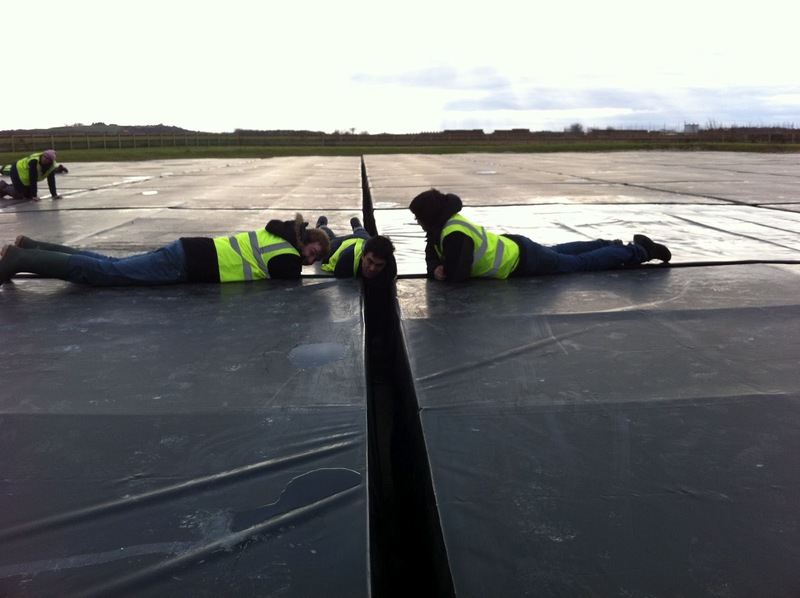 3 of the metal ground sheets were displaced and had to be replaced. 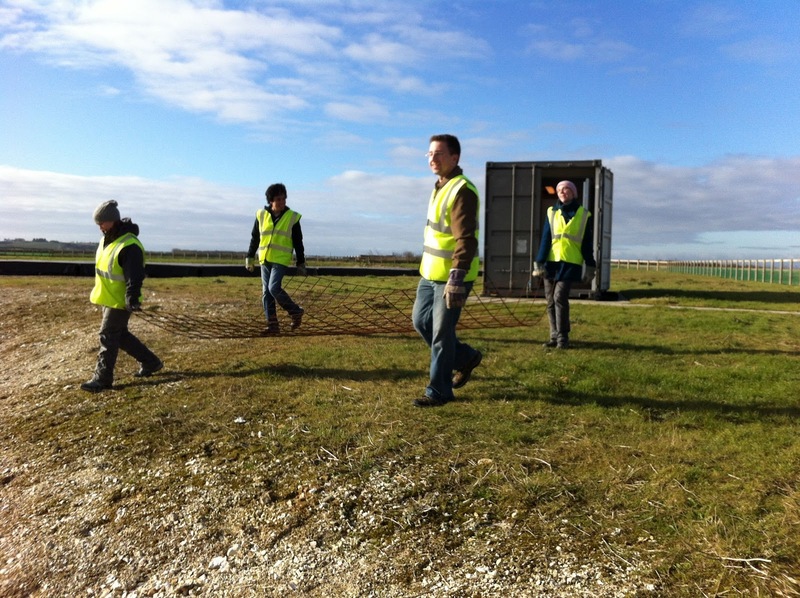 Here a crew carry the wire mesh over to its new home. Where the mesh had been displaced we had to resurvey the site to make sure we put it back in the right place. 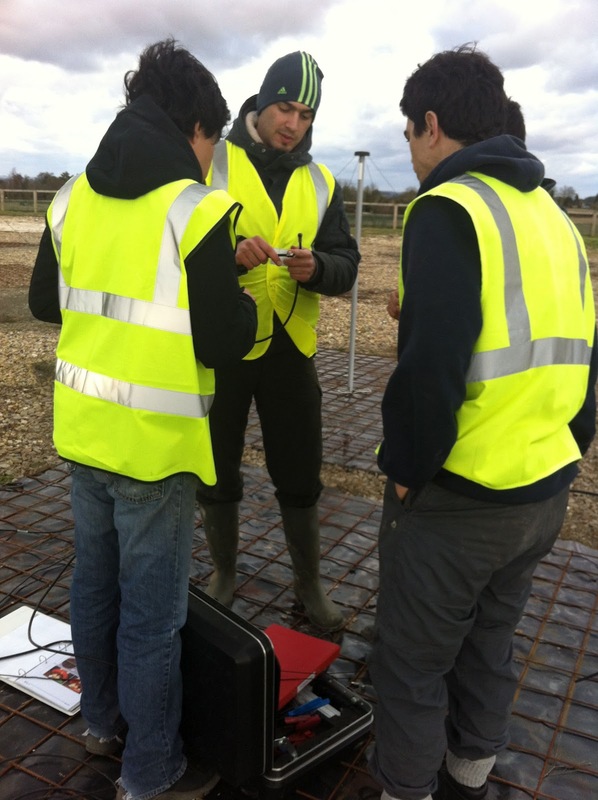 We did this by measuring distances from the 3 nearest undisplaced antenna. With wavelengths of 1-3 metres, a tolerance of up to 5cm is totally acceptable - but we made sure they were good to better than that where we could. 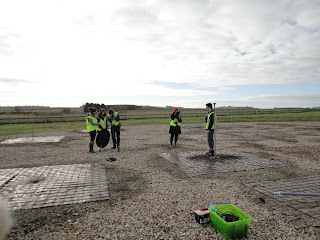 Some of the pegs also got concreted into the ground where they had worked a bit loose. 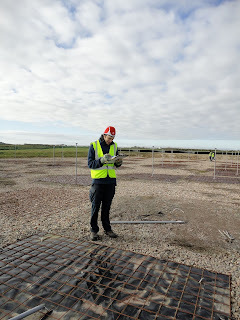 Once the ground sheets were back in place (and for the 12 other LBAs where the damage was just to the pole and electronics) we replaced, or put back up the LNAs and poles. In the below picture Derek shows a crew from Portsmouth and Southampton what to do. 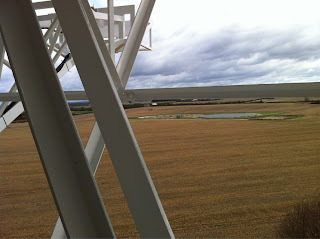 The pride in a newly fixed antenna back in the array is clearly evident. 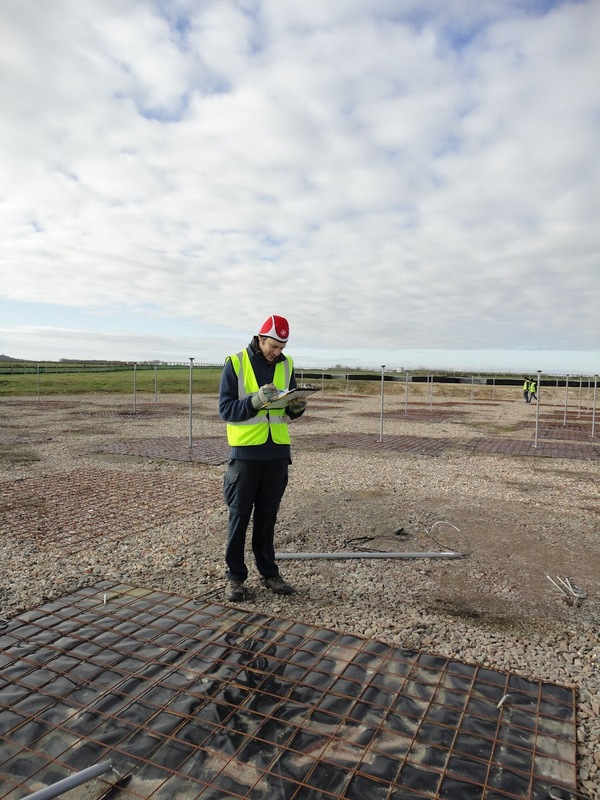 An important part of the job was surveying the field and checking which antennas had been finished. 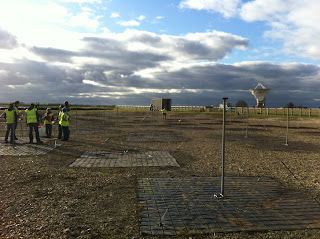 It's surprisingly easy to get lost in a field of 96 LBAs - they all kind of look the same! 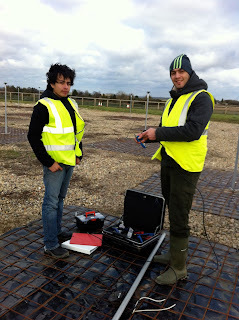 Some of the cables needed some attention. 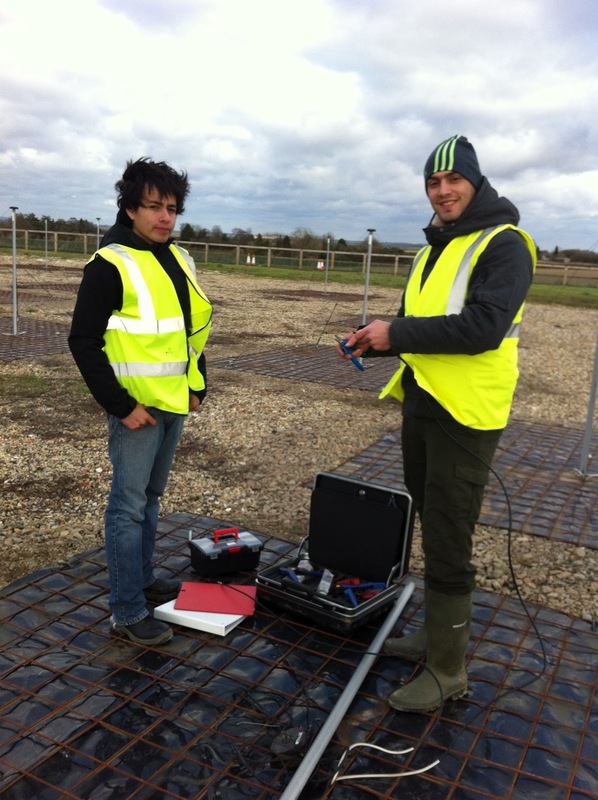 This is being done very carefully by Andreas below who hopes to use LOFAR data in his PhD thesis (at Portsmouth). 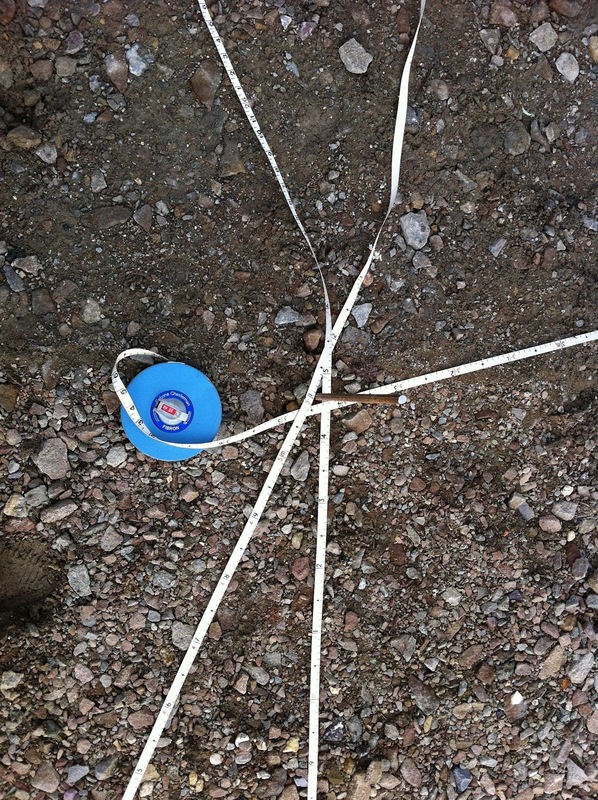 Spare parts were carefully collected in the below box (properly labelled). 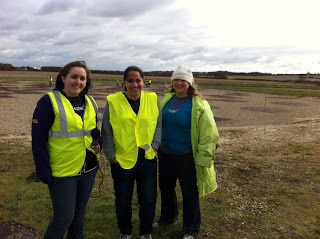 And a final "police sweep" of the field was done at the end of the repairs, to make sure nothing was missed. Derek was quite right in his prediction of windy but dry weather, and the Sun even came out towards the end of the day to provide this dramatic shot of the beautiful Chilbolton sky. 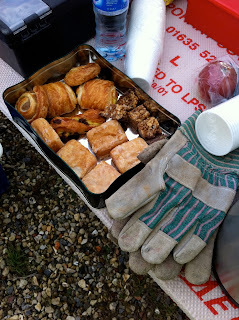 The Chilbolton staff looked after all the volunteers very well, even providing some home baked goodies for our lunch. 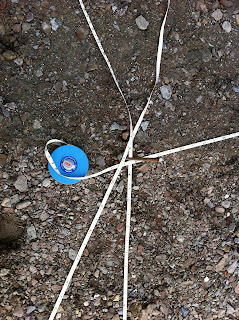 Then it was on to the damaged HBA. The railway sleepers which had been temporarily holding things down, and the damaged cover were carefully removed. 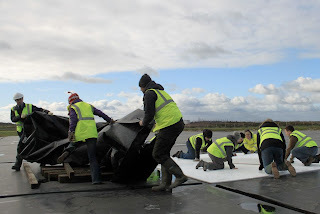 Then a number of us had very important jobs sitting on tile lids to make sure they didn't blow away, while Derek replaced some of the damage polystyrene structure inside the delicate HBAs. 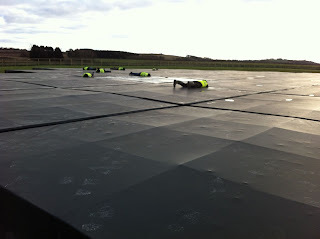 Finally we replaced the destroyed lids. 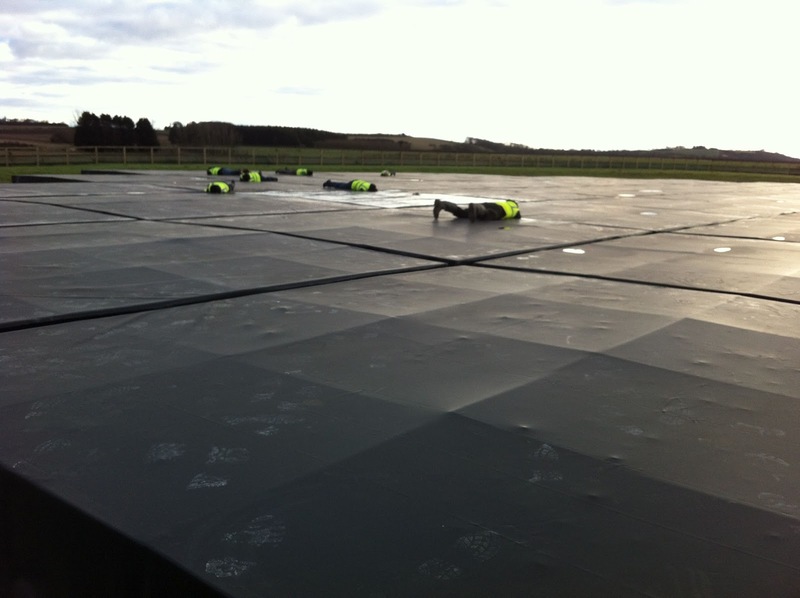 The final job for the HBAs was to survey all the connections tying down the black plastic covers and tighten them where necessary. This involved lying down on the job a bit. 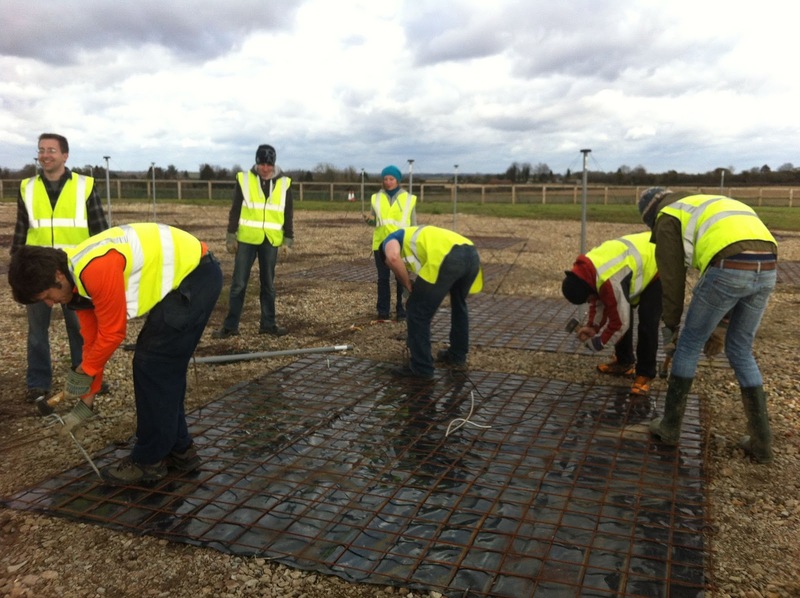 No they aren't having a rest - they're working very hard. A particularly troublesome tie so three heads were better than one! 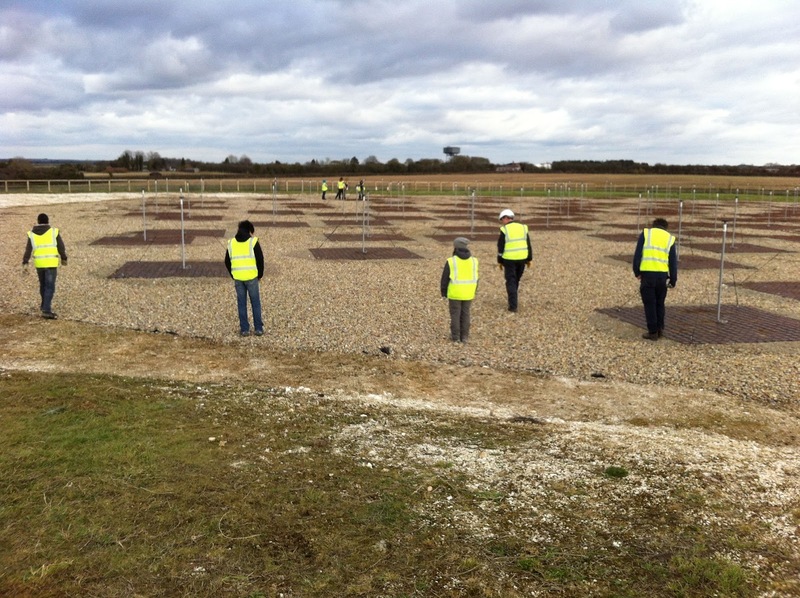 LOFAR-UK also played host to some visitors for the day. 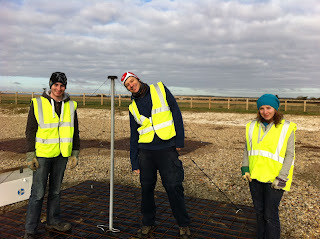 Three members of the Jodcast crew came down from Manchester. 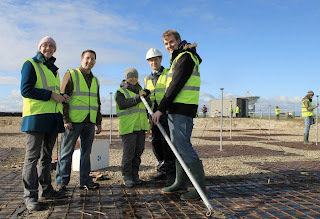 You can expect to hear more from them about LOFAR soon. 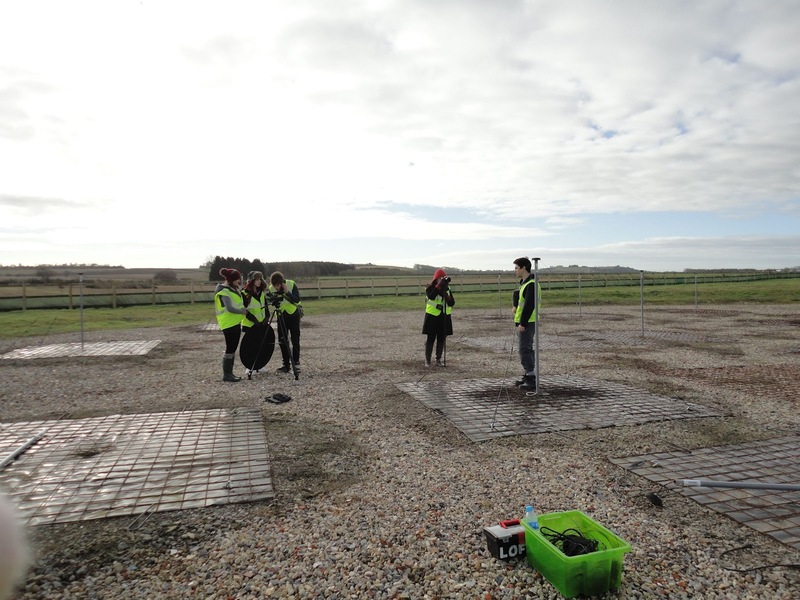 We also hosted some media students from Portsmouth Uni CCi who are working on a documentary about LOFAR. Science writer, Dr. Lucy Rogers (@DrLucyRogers) also visited and played a fun game of "guess where I am" on Twitter (Storify of that). 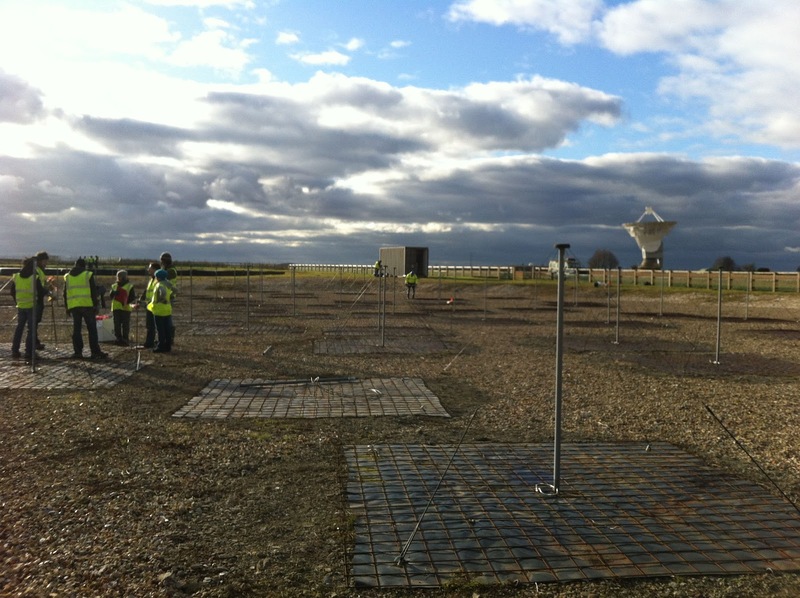 She got to visit the 25m dish along with James Macfarlane, or @rocketengines (who used to work at Chilbolton) and took the below picture of the LOFAR station from up the 25m dish. 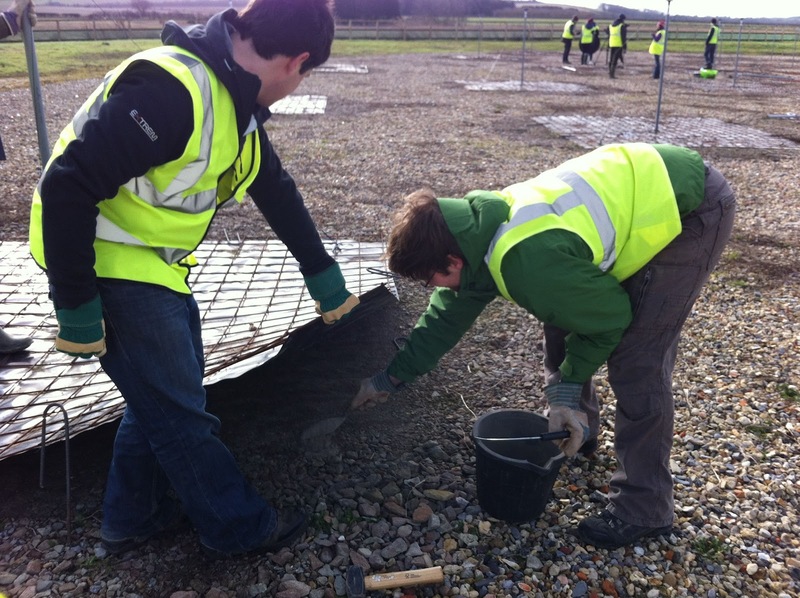 We're all in that picture busily working on the repairs, although even with our high vis jackets you can't spot us at all..! 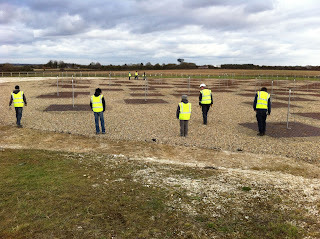 And we also had a visit from the Andover Advertiser, Chilbolton's local newspaper, who have covered LOFAR before. 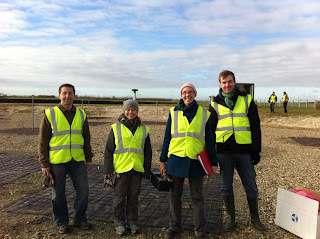 All in all it was a successful and fun day, and an interesting change from our usual jobs!